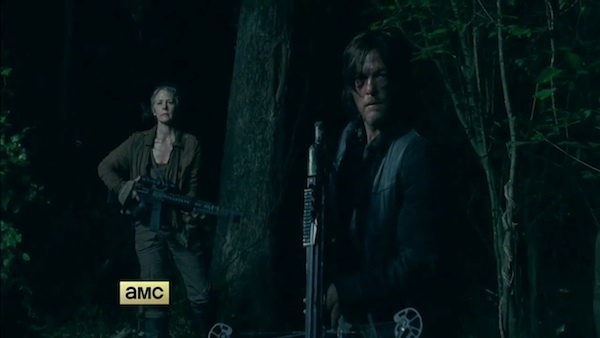 As it relates to the start of Season 5 of The Walking Dead, it may be safe to assume that we've seen the bulk of the new footage we're going to see between now and the premiere, with new snippets and teases worked into previously revealed footage. Granted, there's a little over a month until the AMC zombie drama returns for its fifth season, so there's still plenty of time for AMC to promote the series, and we might even get a decent-sized clip or two before the premiere. But the trailers we're seeing lately seem to be reusing a lot of the same material. And that's just fine. After all, if they show us too much of the season premiere, we might be able to piece together a lot of what's about to transpire. As it stands now, we already have plenty of hints as to what's ahead. Take the latest preview above, which is titled "Never Let Your Guard Down." It begins with the trouble with the Terminus people, the disturbing sight of Glenn bound and gagged and Gareth's creepy smile as he and Rick stare each other down. From there, we move on to what appears to be a conversation between Rick and Carl. Or perhaps it's more of a lecture from Rick to his son about how he should never let his guard down. Is this just a moment Rick selected to remind Carl of the constant and unpredictable dangers of this world? Or did something happen that led Rick to realize Carl needed this conversation? What exactly is blowing up there? And is it connected to the sight of Abraham falling to his knees? That's a sight we glimpsed in the first trailer, and it still makes me wonder if maybe something happened to Eugene or Rosita. Not only is it great to see them reunited, but it's also great to see them armed and looking ready to handle whatever's ahead of them. The two characters were featured together in one of the gallery photos AMC recently shared for The Walking Dead Season 5. The Walking Dead returns for Season 5 on Sunday, October 12 at 9:00 p.m. on AMC. So there's that to look forward to. And it seems things are inching forward for the potential Walking Dead spinoff "companion" series, which recently received a pilot order.